Kimitec Batallon with 37.6% fulvic acids is a unique product that is used to feed the microbes in your grow media. Kimitec Batallon with 37.6% fulvic acids is a unique product that is used to feed the microbes in your grow media. During the process the microbes will break down the nutrients in the grow media and make them super available to the plants. 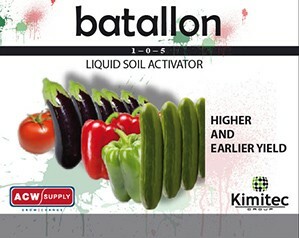 When using Kimitec Batallon consider lowering the overall nutrient strength to avoid burning the plants.